Your kid loves frogs and want's to have a Frog birthday party. Hop on over and lets start planning. Make frog invitations out of frog theme paper or copy frog pictures from the internet and print out. Mail the invitations with glitter or confetti inside green envelops. Or why not use a small plastic toy frog and write the party information using a pen. Hop on over to "Birthday child's name" 4th Frog birthday party. Date___, Time___, Address___, RSVP to "phone nr by date". Decorate the frog birthday party area to look like a frog paradise. Decorate the party area with lots of green balloons and streamers. Make frogs out of construction paper and put them everywhere in the party area. Also, If you have stuffed frogs put them every where in the party area and attach green helium balloons to the frogs. Make a sign with frogs on it and hang it on the front door saying something like "Hop on in!". Decorate your yard to look like a frog mania. Use an inflatable pool - the pond and fill it with lots of plastic toy frogs. Use a green vinyl table cloth and cups, plates, etc with frogs on them. Decorate the table with plastic frogs. Use a big stuffed frog for centrepiece and attach helium balloons to the frog. Dress your little angel up as a frog or just use some face paint to give her a frogy look. Ask guests to dress up as frogs or transform them into frogs when they arrive to the frog birthday party. Beforehand print out some frog colouring pages out of the internet. At party time invite the kids as they arrive to colour some frog clipart with markers, while they wait for other kids to arrive. Invite the kids to make frog cookies. Make sugar cookies as normal and let the kids decorate them to look like a frog on a lily pad. Let the kids frost the cookies with green icing and put a gummy frog on top. This frog birthday party game is similar to Pin the Tail on the Donkey. Drew a frog on a large piece of paper without a tongue. Draw and cut out lots of red tongues. Remember to blindfold the kids and spin them around 3 times before they can pin the tongue on the frog. This frog birthday party game is similar to Musical Chairs. Cut out large lily pads out of green posterboard and laminate. The little frogs have to jump from one lily pad to another while music is playing. Stop the music the little frog who is not standing on a lily pad is out of the game. This frog birthday party game is similar to Duck, Duck, Goose. Invite the kids to sit in a small circle - they are all frogs. 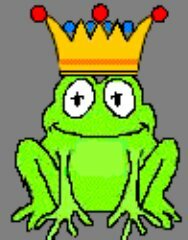 Pick one kid to be "It", he has to walk around the outside of the circle, tapping the top of each frog's head and saying "frog, frog, frog". After a while "It" chooses a tadpole by tapping one players head and calling out "tadpole". The tadpole has to stand up and chaise "It" around the circle, trying to tag him before he reaches the spot where the tadpole was sitting. If he reaches the spot and sits down before getting tagged he is safe and tadpole becomes "It" and the game starts again. If "it" doesn't tag him the game starts again with "It" being "It". This game is lots of fun. Have a bucket full of bubble liquid with a wide variety of blowers and invite the kids to have a frog bubble war. This frog birthday party game is similar to the traditional croaking contest - who's croak is the loudest, sillies, most realistic, funniest? Have certificates ready for the winners. Lots of fun and the kids will feel like real frogs. Measure and record how far each child jumps with a measuring tape. Have a Frog Jump Certificate ready for the winner. Put mud and frogs in a bucket. Each kid has one minute to grab as many frogs as possible. This game is so funny, the kids get a thrill trying to grab as many frogs as possible. Have a small price for the winner. Beforehand hide small plastic frogs around the party area. The kid who finds most frogs is the winner and gets a small price. Lots of fun and the kids love piñatas. Surprise everyone with a frog piñata. Finish the party off with frog facts. Read out loud and ask the kids questions if they don't know the answer explain it to them. Frog Sandwiches: Make frog shaped sandwiches with frog cookie cutters. Fill the sandwiches with your kids favourite filling. Frog Cookies: Make frog shaped sugar cookies and frost them green and add sprinkles. Jelly Frogs: Make jelly frogs using green jelly and frog cookie cutter. Fly Ice Cream: Serve scoops of green ice cream with green sprinkles. Frog Drink: Serve blue punch with foggys floating in frozen ice cubes. Frog Cupcakes: Decorate cupcakes to look like frogs. Use green icing and fruit roll-up tongue or gummy frogs on top. whole cake green. Make little lily pads from fruit roll ups and place chocolate frogs on them. Voila you have a very nice looking frog cake. Make the goody bags out of small green lunch bags. Decorate the bags with frog stickers and white glue glitter. Fill the goody bags with a frog eraser, frog stickers, frog shaped bubble necklace, frog key-chain, frog bubbles, inflatable frog beach balls, frog shaped bath oils, frog bath fizzies and lots of gummy frogs. I hope our frog birthday party ideas will help you plan a awesome frog birthday party!